Let’s face it, one of the biggest obstacles as a digital marketeer is making sure your customers make it through their buyer’s journey seamlessly. It can be difficult to understand what your customers are thinking or feeling. Let alone understand why individuals do the things they do. At Crobox, we’ve made it our mission to understand the reasons behind why people behave the way they do online. Through the course of our research and experience implementing our technology onto our client’s webshops, we’ve found several barriers that virtually every shopper faces within the online sales funnel. These barriers, which cause psychological strain, can prevent your shoppers from completing their orders. Luckily, we’ve found several proven ways to aid shoppers in overcoming these by offering the right nudges at the right time. From the Product Listing Page to the Checkout, these are our findings. We live in an age of choice, with webshops at the epicenter of it all. Everyone wants to feel unique, so producers create options for their customers to express themselves. While for some these choices are empowering, for others they are detrimental to their decision confidence, motivation, and ability. After scrolling through page, after page, after page, motivation starts to fizzle and frustration rises. Humans have only a limited amount of cognitive resources that they can “spend” on activities. That’s the reason we feel so drained after a day of studying, research, or tough negotiations. We expend so much brain power on these tasks that we feel depleted and tired, even if our physical activity for that day was minimal. This idea isn’t so difficult to grasp. In fact, the brain uses more than 20% of a person’s daily energy intake. So it’s logical that when you think hard about something for an extended period, you become tired. Making a decision is no exception. Even though it doesn’t take the same amount of resources, if there are too many choices, it can occupy more resources than a person is willing to use on such a task. So, to deal with broad selection assortments, we use mental shortcuts like colors, models, and prices to help us come to decisions faster. Next to these elements, there are other techniques webshops can use to help shoppers make decisions with greater ease. 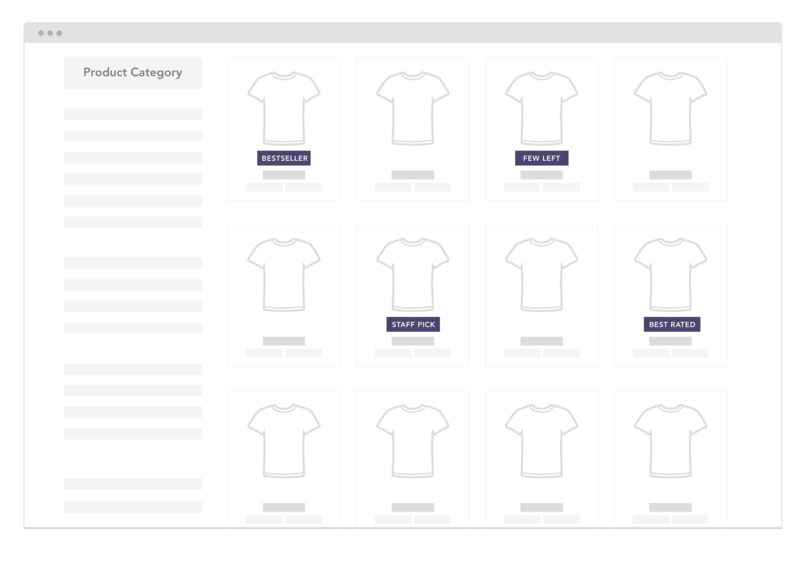 At Crobox, we use product tags to speak to the subconscious of shoppers and decrease choice overload. Product tags are successful because they have the power to shape a person’s choice architecture while speaking to their innate tendencies. Too vague? Let’s break it down. Visually, product tags, like those shown in the image above, are featured on products to make them stand out from the sea of products. Textually, they use words that speak to human bias. For instance, studies have found that some individuals are more susceptible to social proof messaging than authority messaging. Throughout our testing, we’ve found that some principles work particularly well with an audience, while others have an adverse effect (when compared to control conditions). These findings highlight the importance of testing to find what messaging fits your target audience best. At this point in the buyer’s journey, individuals are more or less interested in a product - something sparked their attention, whether that was the product tag or the product itself. But how do we nudge them to move further with their choice? According to Fogg Behavioral Model, three essential elements must be present for individuals to behave: ability, motivation, and a trigger. If we look at these elements on the Product Detail Page, we can assume that the shopper’s ability is high and the trigger is there. That leaves increasing add-to-cart motivation as the primary barrier on this page. One way to increase purchase intent is by providing relevant information. On the Product Detail Page, shoppers conduct an information search to confirm or deny whether the item is worth their time, effort, and money. However, these information needs likely differ per shopper. While some may seek product related information (material, sizing information, etc), others may already be convinced of their choice and want to know process details (shipping time estimates, unforeseen costs, the return policy). These differences should be addressed on the webpage by offering relevant information that these two shoppers need to increase their motivation. It’s vital that this information stays within the scope of your users’ needs, as including too much makes it harder for them to see through the clutter. With this in mind, we’re one step closer to making the product detail page conversion optimized. But there’s more you can do to boost the persuasive nature of your Product Detail Page and nudge your users to act. To boost users’ motivation, we include behavior-driving copy that addresses potential shopper concerns. We do this through a combination of smart notifications and nudges. These interactive notifications catch the eye and prompt users to click them away, thus bringing more attention to their content. Like in the example above, these can be used to drive behavior by reminding the shopper of the popularity of a product based on how many people have viewed it, bought it, or saved it to their wishlist. Another, more subtle, approach is to embed copy into the webpage. In the example above, we used urgency driven text to convey the benefits of ordering now (i.e., receiving it tomorrow). Other effective copy for nudges on the Product Detail page can relate to the number of items left in stock (if limited), fast delivery, or hassle-free returns. What are our customers' concerns? How can we address these? Is there a way to make ordering this product easier or faster? Are our customers responsive to urgency, social proof, or other types of messages? Your soon-to-be customers have reached a pivotal moment: their favorite products have been added to the cart. So far, so good. At this moment in their journey comes the process of consolidation. Shoppers take a second look at their cart and are likely to deliberate their product choices in relation to their total, eliminating products when necessary. Similar to the product detail page, the primary barrier shoppers face at this point of the funnel is maintaining their motivation. So how do you decrease cart abandonment? Through the use of nudges and interactive overlays, we have been able to influence motivation and decrease cart abandonment. Again, nudges can be used to maintain the motivation of customers on the Shopping Cart Page. To decrease cart abandonment, this is the moment to remind your shoppers of why they added specific products to their cart (e.g., because it was the most popular, a staff pick, exclusive offer, limited stock, etc.). For this, you can simply use the copy from the Product Listing or Detail page, and embed it under the product name in another font color. Additionally, if you can get your users to invoke ownership of their products, they will be less likely to leave them hanging. We call this the Endowment Effect, which explains that when a person owns an object, they assign more emotional value to it than the actual financial worth. Using copy like “Great selection! Your summer wardrobe is sorted.” or “It’s almost yours!” on the shopping cart page can trigger customers to establish ownership of the items and encourage behavior. Other ways to boost motivation with nudges can be done by reminding customers of fast shipping, smooth check-out for account holders, or another offer that your webshop has. Check out this blog post for more tips on decreasing cart abandonment. Interactive overlays are dialogue boxes that appear when an individual shows exit intent. While these should be used sparingly, no one wants to trigger the second coming of the pop-box, we’ve found some success when used on the checkout page. Especially when paired with price sensitivity messaging, aka discount-driven copy, we’ve seen significant increases in continuation to checkout. While this seems like a logical conclusion (and it is), what makes it more interesting is that offering the discount at this stage of the journey is more effective than displaying it at earlier stages. Phew! Finally, the final stage of conversion success: checkout completion. Whereas all the previous steps put the most attention on increasing motivation, the checkout page should put all effort in increasing the ability of users. State the shipping costs clearly before asking for information from the users. Use a progress bar and allow customers to go back to edit fields without having to start over. Allow guest login, not everyone wants to create an account with your brand. Plus, it takes time, shoppers would rather spend their time on the “fun” stuff of a website — like picking out their new products. Use as few fields as possible when it comes to filling in invoice and shipping information. Do you really need someone’s phone number to deliver their product? Don’t let the concern of being called or giving away unnecessary personal details be a barrier to conversion. Auto-fill any information you’ve already obtained for returning users. Design and optimize your site for mobile users in a way that makes checkout easier. Remove the barriers, reduce frustration. 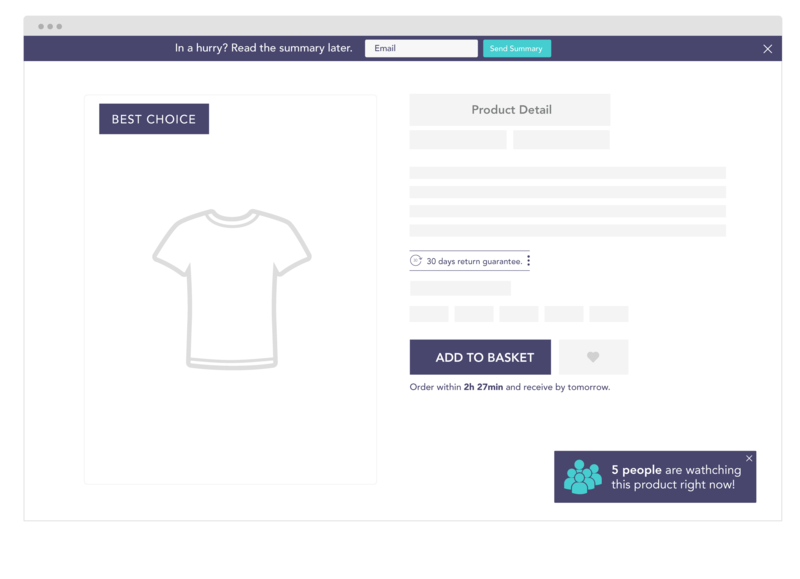 Product Listing Page: Increase click-through rates by decreasing Choice Overload with product tags on specific products. Product Detail Page: Increase add-to-cart by boosting motivation with smart notifications, nudges, and relevant product/process information. Shopping Cart Page: Increase check-out motivation with interactive overlays and nudges. Checkout: Increase checkout-completion by making the checkout fast and straightforward.